Born at Hamden, Connecticut in 1834, son of Guy Barber, he received little in the way of formal education and at the age of fourteen he left home on a year’s voyage around Cape Horn to California. By 1854 he had moved to St. Paul, Minnesota where he found employment with the Minnesota Democrat newspaper. In 1856 Barber’s cousin, George Brott, came west and together they formed the Breckenridge Land Company. In 1859 Brott purchased the dry goods firm of W. G. Fonseca and S. Fullerton of St. Paul and in February 1860, he appointed Barber as his agent to open a retail store in the Red River Settlement. In 1868 Barber extended his business, becoming an agent for furs, hides, and firewood and part owner with J. F. Robinson in the Crescent Farm. 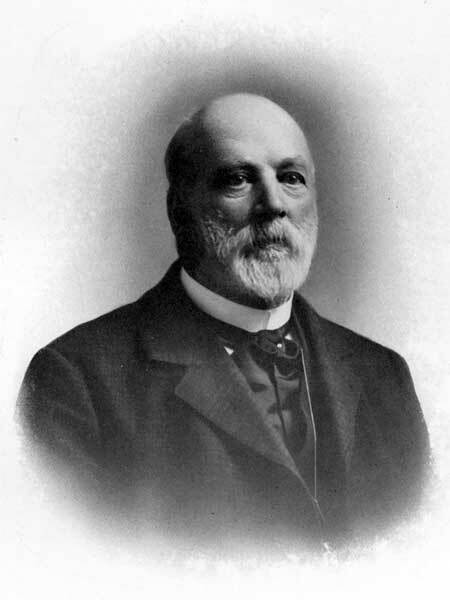 In 1869 he joined J. C. Schultz in a real estate venture in the Point Douglas area. His business prospered with the arrival of the Wolseley Expedition as he received part of the Mounted Constabulary account. His business soon declined, however, and to pay his creditors he entered into a brief partnership with John MacGregor in 1871. In 1872, he opened a store in Portage la Prairie which was operated by Martin Burnell, which proved to be a failure, as were his plans to operate a saloon at Pembina, North Dakota to capitalize on the thirst of the Boundary Commission surveyors. At the time of his death at Winnipeg on 24 April 1909, his daughter Lillie was active in managing his interests and continued to do so for several years. His home at 99 Euclid Avenue in the Point Douglas area still stands, and is one of the few remaining examples of early Red River Settlement architecture. He is commemorated by Barber Street in Winnipeg. His extensive business and personal papers, including textual records, photographs, and paintings, are held at the Archives of Manitoba (MG14 C66) from which the above biographical sketch was obtained.